“We are all BUILD,” mused Janani Duraisamy, reflecting upon her position as Learning Center administrator for the past year. Janani is a student and resident of the village of Thottiyapatti, a bustling hamlet of about 300 people located approximately three kilometers from the larger village of Thenur in rural Perambular, Tamil Nadu, India. 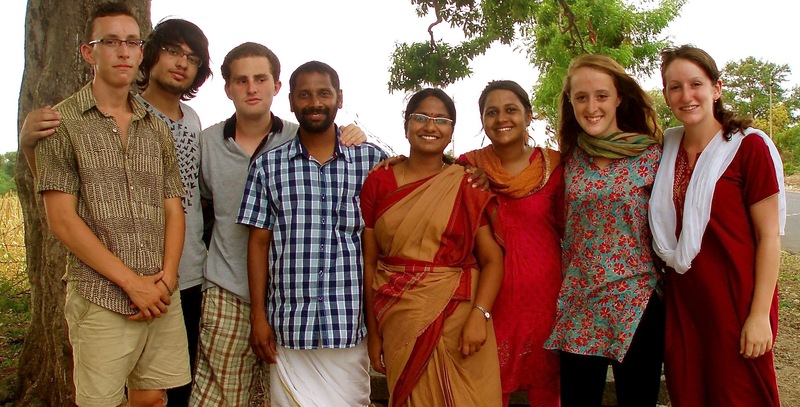 For the past two years, the IGL’s BUILD: India program has been working with the NGO Payir and members of Thottiyapatti to improve education, health and sanitation, and socioeconomic conditions in the village. BUILD’s three projects are: a community learning and computer center, ecological sanitation (ECOSAN) community toilets, and microenterprises in partnership with some of the local women. Prior to this summer’s trip, the Learning Center had been constructed and functioning for a year, the toilets were waiting approval and funding from different levels of government, and BUILD had been in communication with two women interested in soap-making. Our project goals this trip included: meetings with the District Collector and Panchayat Thallaivar to ensure the approval for the toilets, commencement of toilet construction, production of soap leading to skill-based empowerment, increased English exposure for the village children, and community meetings as well as individual and small group conversations about our projects with people in the village. These specific plans corresponded with our overall themes for this trip: creating stronger relationships with the adults of the village, fulfilling our role as a network, connecting the village with its government, and taking steps to ensure the sustainability of our projects. In Summer 2011, BUILD and the community of Thottiyapatti collaborated in the construction of a Learning Center to provide after-school tutoring to the village children and to serve as a place for additional educational and vocational opportunities and community activities. The Learning Center now stands as a small cement structure near the village primary school and houses two computers, a variety of Tamil and English books, and drawing materials. Janani has referred to the Center as “a light in the village”, as it is something of which the community is proud and is also literally a source of light. Solar panels are the source of the Center’s electricity, making it a popular place for village youth to study because of the constant light source that is not interrupted by the power cuts often suffered by the rest of the village. A year after the inception of the Learning Center, it has enjoyed many successes but still faces challenges, such as lack of programming and dwindling attendance. To address these challenges, this summer we provided Janani and Anusuya, another coordinator, with trainings from AID: India’s Superkidz program. The program stresses how to teach Math and English and provides a well-designed curriculum with textbooks and workbooks for the students. Janani’s and Anusuya’s contact with AID: India will continue in BUILD’s absence, as two more trainings have been scheduled for the remainder of the year. Furthermore, to better equip the center for increased use, BUILD met with the American International School in Chennai and reached out to various contacts to secure three desktop and three laptop computers. We also arranged funds for the purchase of an Uninterrupted Power Supply (UPS) so that power cuts will neither damage future computers nor hinder their use. In addition to the improvement of the Center’s operation, BUILD took big steps towards solidifying the community’s ownership of the Center by initiating a Committee of Thottiyapatti stakeholders, with whom we held several meetings discussing the future of the center. This committee includes three women, four youth (young men), and one elder man. By the end of the trip, the committee developed a constitution of sorts, with a mission statement, rules regarding its members, a method for dealing with issues that arise at the Center, and a course of action for staying in contact with BUILD. BUILD hopes that eventually this committee will be able to fully run the Learning Center, and that it will branch out to play a large role in the advancement of the community as a whole. Although the committee will take time to organically identify its role, its establishment has been one of the most significant achievements to date, as it will increase community participation in running the Learning Center and provide an avenue to directly voice ideas and concerns to BUILD. Also in summer 2011, BUILD began a sensitization campaign for ecological sanitation (ECOSAN) toilets that was well received in the village. This particular model of toilet separates dry and liquid waste to produce a usable fertilizer after a six month decomposition period. In spring 2012, BUILD received a $3,000 grant from the Tufts Energy Conference to pursue this project. Since 2011, BUILD has kept in close contact with SCOPE, an NGO based in Tamil Nadu that has successfully implemented the ECOSAN model in Musiri village. Before the summer trip, BUILD arranged for 20 community members, including the Panchayat Thallaivar (head of local government) from Thottiyapatti, to visit the toilets in Musiri. This trip confirmed Thottiyapatti’s interest and the local government’s support in establishing a similar model. This summer, the BUILD team met with SCOPE to discuss the project in more depth and to develop a plan for its implementation. We met with an architect to receive the blueprint and materials list/costs for the construction. On several occasions, we spoke with the Panchayat Thallaivar regarding particulars of the toilet construction and how he will be involved throughout the implementation process. We met with the Block Development Office’s Head of Rural Development to secure financial support for two-thirds of the project cost and half of the wages for the maintenance worker. And finally, we took a trip to the District Collector’s office to submit all of the necessary paperwork upon which we found ourselves discussing with him our other projects as well as the Indian government’s role in development on the macro-level. During our trip, a Panchayat resolution with a survey number was passed to allow for usage of government land, funds were acquired and submitted with the ECOSAN toilet blueprints to the District Collector, materials for sensitization were collected, and two people from Thottiyapatti have agreed to pioneer their own construction of individual ECOSAN toilets. Throughout all of these steps, we maintained our partnership with NGO Payir and representative members of Thottiyapatti (including Panchayat member, Sekar, and mason, Manikras), keeping them fully involved to ensure continuity in the project when we are back at Tufts. Furthermore, groundwork was laid for the sensitization process through establishment of the Committee of Thottiyapatti stakeholders (mentioned above). As has been brought up within the Committee itself, the installation of community toilets will be a challenging process with an extremely rewarding outcome. We hope the Committee will play a large role in the sensitization process of establishing successful community toilets. Lastly, BUILD, in conjunction with Payir and a few women of Thottiyapatti, continued to pursue an income generation project. During the January 2012 trip, we established close relationships with two women, Vijayrani and Vinila, who expressed an eagerness to learn new skills and a desire to use the free time they have during the day to pursue a small income-generating enterprise. Throughout the spring semester, we conducted research about successful rural enterprises and wrote a business proposal based on our findings. We kept in close contact with Vijaryani, making weekly calls to her and keeping her involved in the progress of our research and business proposal. In addition to preparing a business proposal and plan of approach for the development of the project, we spent several weeks before the trip reaching out to contacts in the region to learn more about women’s self-help groups, rural empowerment, and income generation in Tamil Nadu. A week after reaching Thottiyapatti, a group of us braved five or so buses and half a day's travel to reach two NGOs, Thulir and Tribal Health Initiative (THI), in Sittlingi. Sittlingi itself is extremely green, resting comfortably in a valley of large, towering mountains. Due to its isolated geography, the region has been slower than most in experiencing the effects of globalization. The region is mainly inhabited by peoples of the Lambardi tribe who, generations ago, had trekked down from North-east India. Over the last decade or so, a number of NGO's have settled to assist with the region’s development, focusing on health and branching out to educational and income-related initiatives. During our stay, we met with the founders of Thulir, an education-focused NGO that embraces the ideology of education through hands-on skill training. Over the past eight years, Thulir has grown to include handicraft-making, bee-keeping, chicken farming, organic farming, and other various endeavors as part of its progressive curriculum. They hold scheduled educational sessions in a learning center, similar to the one constructed by BUILD in Thottiyapatti. Thulir’s campus also includes a computer center, several ECOSAN toilets, and a workshop with tools for basic construction, bike repairs, electrical repairs, and soap-making. Before leaving, we were able to make a batch of soap with the students who help run the NGO. This soap recipe and process served as a model for the soap-making initiative in Thottiyapatti; Thulir’s other aforementioned initiatives also gave the team more ideas and insights about our own similar initiatives in Thottiyapatti. In addition to visiting Thulir, we had the opportunity to stop by THI. We spent the day touring the hospital facilities, examining the embroidery craftsmanship, learning about the rural empowerment initiatives that have lead to higher wages, and discussing their newly developed soap-making business. We were impressed by the scale and the success of their organic farming initiatives and plan to spend next semester exploring similar agricultural and livestock income-generation possibilities. Although it was a setback that neither Vijayrani nor Vinila were able to make the journey, we brought back with us two soap-making recipes that we were able to share with them. Later that week, we managed a trip into Thrichy to buy the soap-making ingredients, including caustic soda, gram (flour), and scents as well as the materials for production: buckets, strainers, sifters and spoons. Payir was able to supply coconut oil, which they produce in Thottiyapatti’s neighboring village, Thenur. Before leaving, we made a trial batch of soap with Vijayrani and other interested women, although there are still many quality issues to iron out before the soap can be marketed. Over the course of the next semester, we will work in conjunction with members of Payir to help Thottiyapatti women create soap suitable for selling in the local market. Along with our NGO visits and soap-making pilot, BUILD conducted a general “market analysis” through informal conversations with 12 or so households. These frank discussions revealed the socioeconomic diversity within Thottiyapatti and informed us on how economic decisions are made at the household level. One of the main observations we made from this analysis is that our income generation initiatives have not yet reached the most disadvantaged in Thottiyapatti. Figuring out how to involve these members of the community in our project will be one of the challenges that BUILD faces in the coming semester, as these are often the people that have the least time and resources to invest in developing their own skills. Outside of soap-making, some additional opportunities for income generation lie in the Learning Center. During our meeting with the Block Development Office regarding ECOSAN toilets, we secured roughly eight government data-entry jobs that could eventually be run directly out of the Center if enough computers, a stable power supply, and computer trainings come to fruition in the near future. Additionally, members of the Learning Center Committee voiced interest in using the Center to host skill trainings in areas such as tailoring. This fall, we look forward to working with Payir and the Committee to promote skill development within Thottiyapatti. This summer, BUILD India made huge bounds in all three projects. For the Learning Center, we took essential steps in ensuring the success of its current operation and sustainability into the future. In regards to community toilets, we coordinated with major actors in the village and government--doing all the necessary legwork so that construction and sensitization occur simultaneously. And lastly, in regards to income generation, we learned invaluable information about villagers’ lives and are now more aware of the possibilities in skill training, empowerment, and future income-generating projects.